Be the first to share your favorite memory, photo or story of Dalton. This memorial page is dedicated for family, friends and future generations to celebrate the life of their loved one. Dalton Fisher, age 87 of Boone, died October 29, 2018 at the Boone County Hospital. Following his wishes, Dalton has been cremated. A Memorial Service will be held Thursday, November 29, 2018, at 7:00 p.m., at the Schroeder-Reimers Memorial Chapel at Sixth and Marshall, with Rev. Matthew Martens officiating. Friends may call at the Schroeder-Reimers Chapel, where the family will be present, on Thursday, November 29, from 5:00 p.m. until service time. Dalton Eugene Fisher, was born in Webster City, Iowa on January 12, 1931, the son and only child of LeRoy and Thelma (Harlowe) Fisher. He graduated from Stratford High School in Stratford in 1948 and in 1949, Dalton married Ramona Anderson. The couple raised three children and they later divorced. On November 29, 1986, Dalton married Kristine ‘Tina’ Belluci in Des Moines, Iowa. 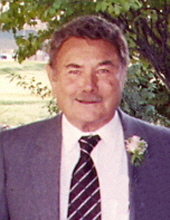 Dalton was co-owner and general manager of Fisher Pontiac in Stratford until 1970 when he relocated to Boone and founded Farm and City Realty. He also developed the Candlewood Village housing area. In 1983, Dalton became partner and vice president of marketing and operations at Duz Mor, Inc., in Des Moines, which manufactures auto and truck collision repair equipment, until 1993 when he retired. He is preceded in death by his parents, and an aunts, Roberta Vegors and Alice Violet Fisher-Carlson. Dalton is survived by his wife and soul-mate, Kris of Boone; his adult children, Debra Bemben of San Bernardino, California, Denise (Paul) Beckfield of Verona, Wisconsin and San Diego, California, and Lee (Lindsey) Fisher of Des Moines; three grandsons; three great grandsons; his mother-in-law, Lorraine Belluci of Boone; his sister-in-law, Lynn Belluci-Adams of Boone. In memory of Dalton, memorials may be directed to the family. The Schroeder-Reimers Memorial Chapel at Sixth and Marshall, is in charge of arrangements. To send flowers or a remembrance gift to the family of Dalton Fisher, please visit our Tribute Store. "Email Address" would like to share the life celebration of Dalton Fisher. Click on the "link" to go to share a favorite memory or leave a condolence message for the family.